The all-new fourth-generation 2013 Toyota RAV4 is set to make its world premiere in LA and Toyota has released a teaser video to give us a preview. Toyota has announced that the all-new 2013 RAV4 will make its world premiere at the 2012 Los Angeles Auto show which starts on Nov 30th and runs through December 9th. The Los Angeles Convention Center will be the site of the reveal as Toyota unveils the new 2013 Toyota RAV4 to the world for the first time. 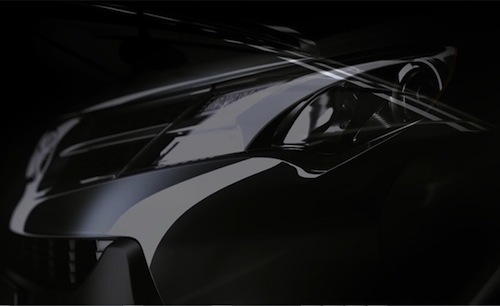 Toyota has released a short 41 second teaser video below that gives us a glimpse of the new crossover. Toyota says the new 2013 RAV4 is “a new generation rewriting the rules of style, embodying sophistication and strength. A dynamism that adapts to the changing pace of life.” What we can see from the video shows the new 2013 RAV4 with all-new styling with lines similar to its larger stablemates, the Venza and Camry. As with most makeovers, the new RAV4 is sure to have larger exterior dimensions that will give the new crossover a larger cabin. We will have to wait and see if the fourth-generation RAV4 will keep its third-row option. Although it certainly looks long enough from the video. Toyota needed to redo the aging RAV4 and the new fourth-generation SUV will have a lot of competition from the new 2013 Ford Escape, Honda CR-V, and Hyundai Santa Fe. The all-new 2014 Subaru Forester will also be making its North American debut in LA and will be another crossover that will give the RAV4 competition. While Toyota hasn’t released details on the new 2013 RAV4, its likely to get an updated version of the current 2.5-liter four cylinder engine that makes 179 horsepower and 172 lb ft of torque. Toyota will need to keep up with Ford’s new EcoBoost 240-hp 2.0-liter twin-turbo powerplant. And the 2014 Subaru Forester will have an all-new 2.0-liter direct-injection turbocharged Boxer engine producing 250 horsepower and 258 lb ft of torque. Toyota will also have some competition for the all-new 2013 Hyundai Santa Fe. The new Sport model will feature a high-output 2.0-liter turbocharged direct injection four cylinder. The twin-scrolled turbocharged four will produce 264 horsepower and 269 lb. ft. of torque. We will have to wait and see if Toyota keeps the V6 engine option. With all the other new crossovers coming out, it was important for Toyota to bring out a totally new RAV4 that will keep buyers interested. We will have to wait and see if the all-new fourth-generation 2013 Toyota RAV4 is exciting enough. Watch the 2013 Toyota RAV4 Pre-reveal video below. Toyota Earns 4 Of Consumer Reports Top 10 Vehicle Picks For 2019 - Is Your Vehicle On The List? I really hope they lose the side swing tailgate, ridiculous spare on the back, and keep the class leading V6 - and the 2 small jump seats. If they build it on the Camry platform it could be a great replacement for my 2007 Highlander when the time comes. It would be great if this one didn't have a cassette player too and maybe knew that the world had moved on to bluetooth and iPods. Many don't realize this is Toyota/Scion's fastest vehicle to 60mph. Hope it remains so.